I baked these crumbles for the Bake Along hosted by Joyce from Kitchen Flavours, Lena from Frozen Wings and Zoe from Bake for Happy Kids. It was originally supposed to be a pear crumble from Epicurious, but I decided to swap out the pears with Granny Smith apples (it was a bit hard to get hold of Anjou pears here). I also wanted to make this a breakfast food so I tried incorporating oats into the crumble – hence also adapting a crumble recipe from Smitten Kitchen. This is a very straight-forward recipe – no mixer is required. After reading the recipe and realising there won’t be any cake-like mixture to hold the apples together, I chose to bake the crumbles in individual ramekins. Baking in individual ramekins is also good to just take, pack and go. 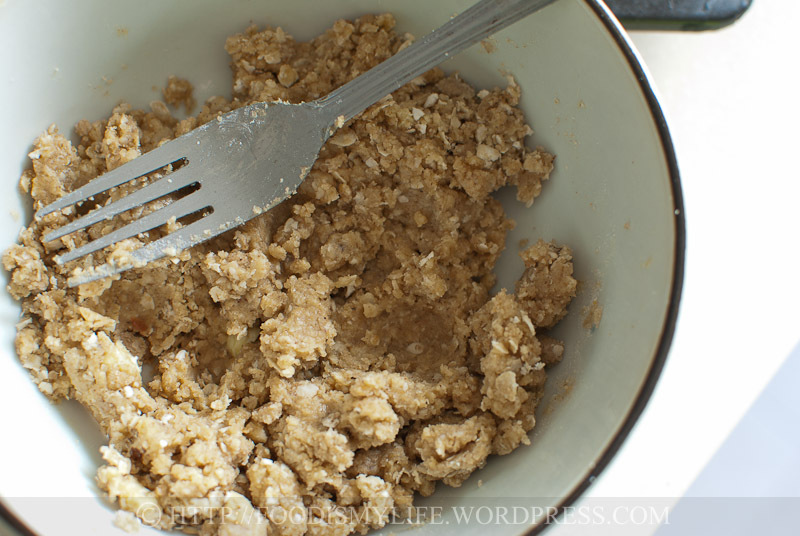 However, the crumbles didn’t even make it through the weekend – we finished all of them within 2 days – they were that good! 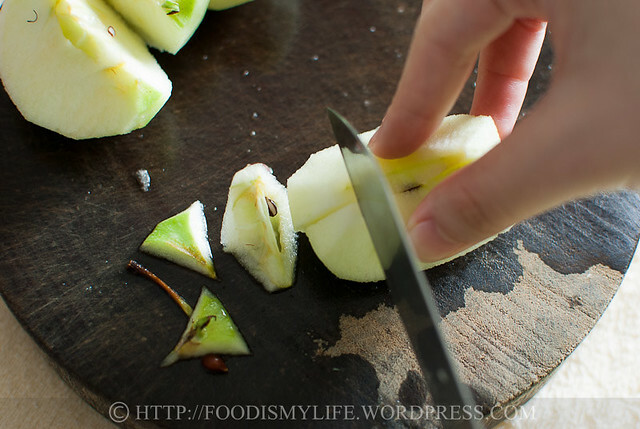 The crumbles were sweet and sour at the same time because of the Granny Smith apples and the cranberries. 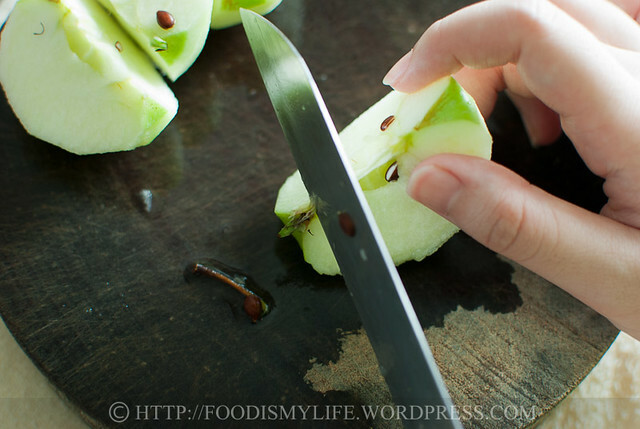 The apples caramelised during baking and released plenty of juices. 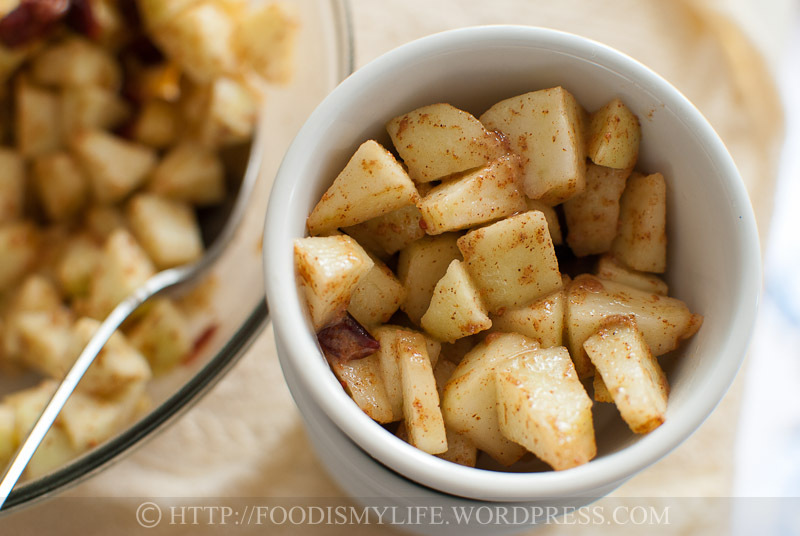 Every spoonful of apples was accompanied with a nice and delicious kick of cinnamon. 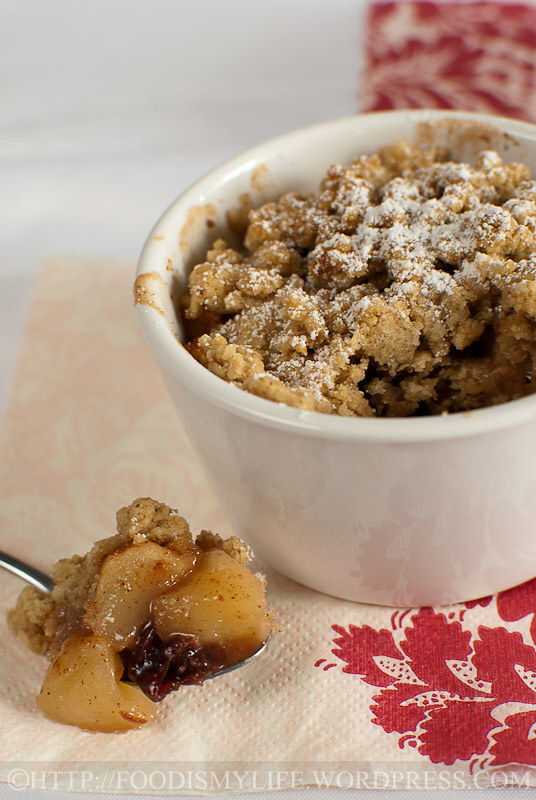 I especially love the crumble on top – it’s mildly sweet, has a light oat taste and not too overly buttery. To be perfectly honest, I actually love the crumble a lot more than the apples! 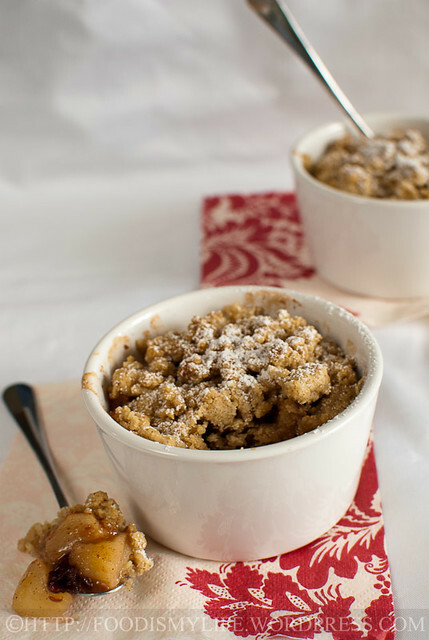 Overall I will definitely be making them again – the crumbles are extremely addictive and absolutely delicious in every way possible. Thank you Joyce (Kitchen Flavours), Lena (Frozen Wings) and Zoe (Bake for Happy Kids) for choosing such a wonderful recipe! Toast some walnuts and let cool completely. 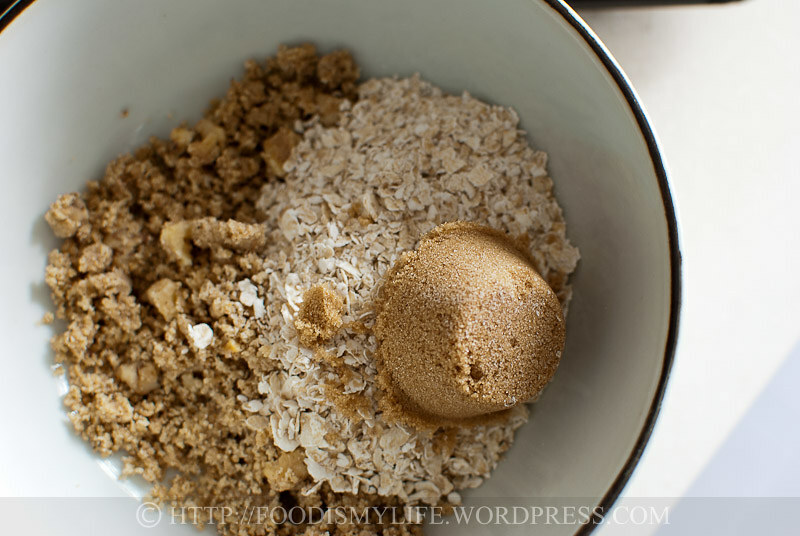 Combine the walnuts and some oatmeal and pulse until a fine crumb. Transfer the nuts mixture into a mixing bowl – reserve some walnuts and chopped it into small pieces for extra texture if desired. … and some cold, cubed, unsalted butter. 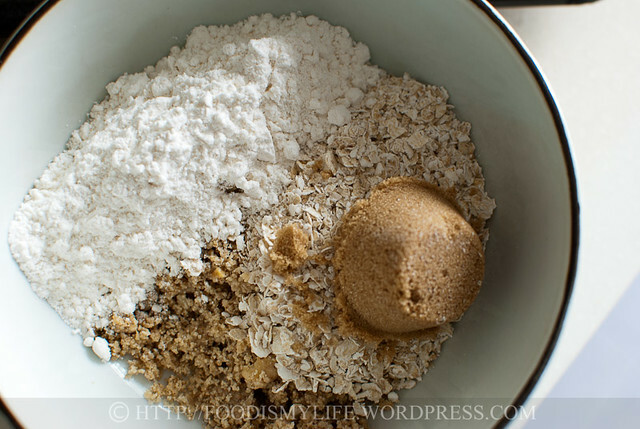 Cut the butter into the flour mixture, then refrigerate the crumble mixture. 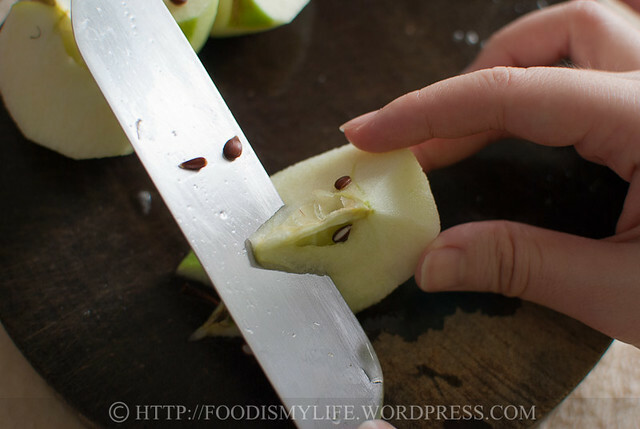 Repeat for the rest of the apples. 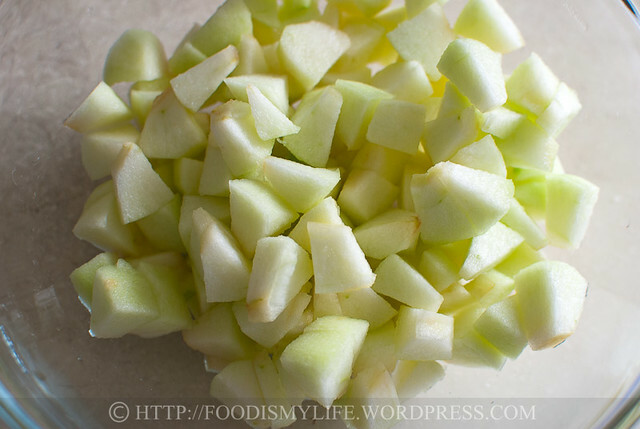 Dump the apples into a large mixing bowl. 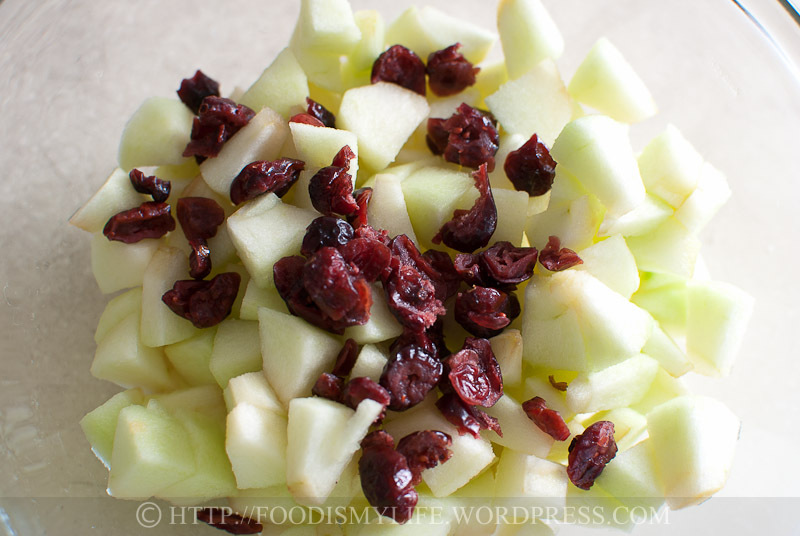 Add in some dried cranberries (or raisins if you’re not a cranberries person). Sprinkle in some lemon juice. Then drizzle in some maple syrup. Toss to coat then divide the apple mix among 4 ramekins. 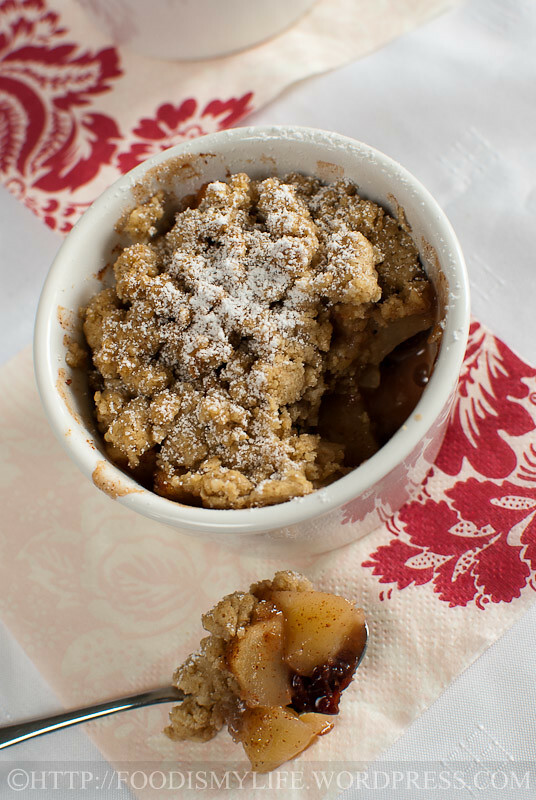 Top with the crumb mixture and bake until the top is golden and crisp and the apple juice are thick and bubbly. Simply delicious warm or at room temperature… I’m drooling just looking at the photo! Preheat the oven to 175 degrees Celsius. 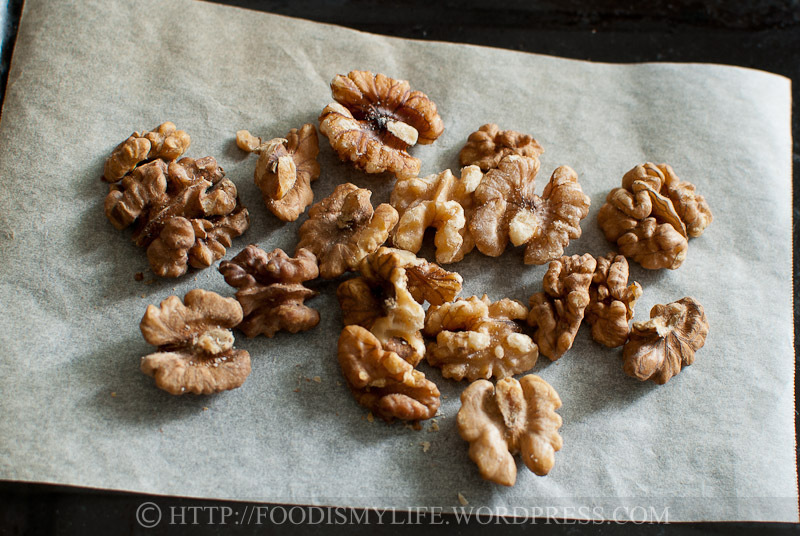 Spread the walnuts on a baking tray in a single layer and bake them for 8-10 minutes until toasted. Let the nuts cool completely. Place the walnuts and 10 grams (1/8 cup) instant oats in a food processor and pulse several times until the mixture resembles fine crumbs. 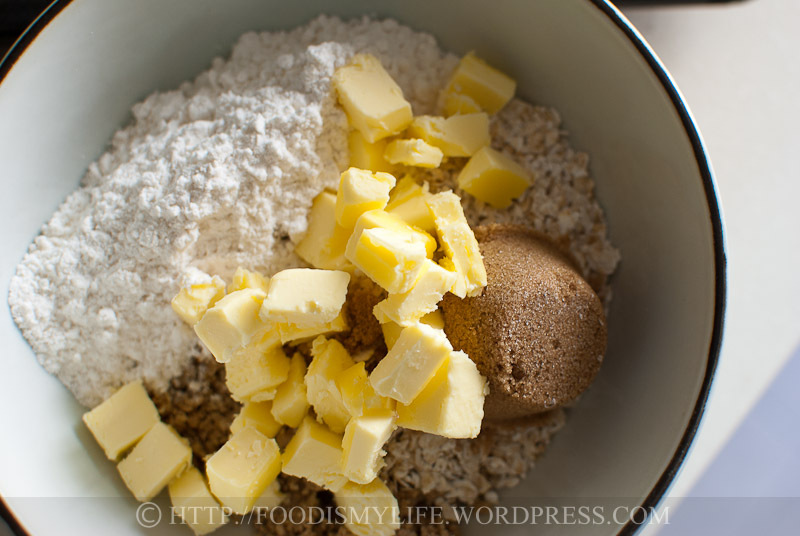 Transfer the mixture into a mixing bowl and add in the remaining oats, flour, sugar and cold butter. Rub the butter into the dry ingredients (using a pastry blender, fork or your fingers) until the butter has been fully incorporated. 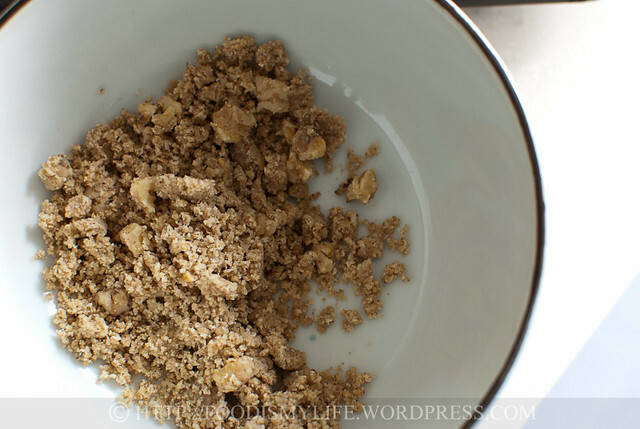 Refrigerate the crumble mix until hardened, about 45 minutes to 1 hour. 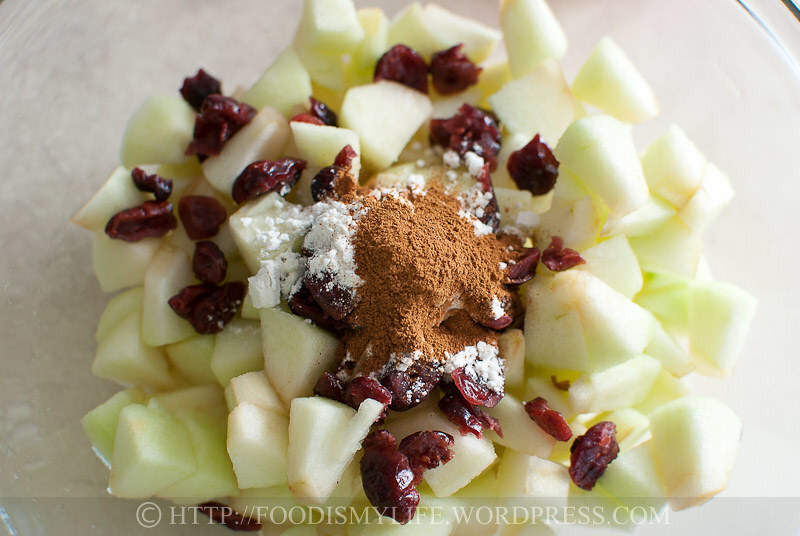 Place the apples, cranberries, flour and cinnamon in a large mixing bowl. 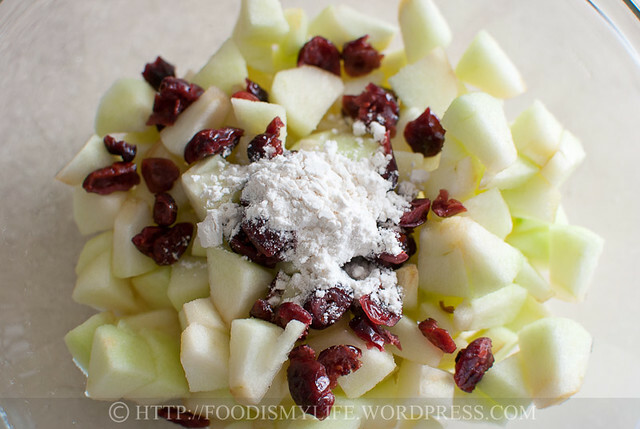 Toss to coat the apples and cranberries with flour and cinnamon. Add in the maple syrup and lemon juice and toss to combine. Leave aside for the flavours to mingle for 15 minutes. 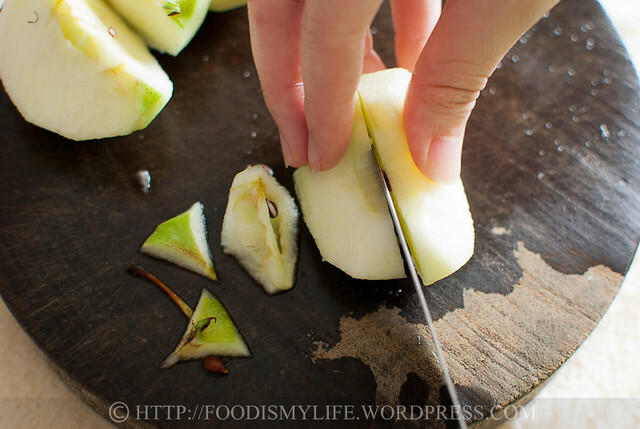 Divide the apple mix between 4 ramekins. 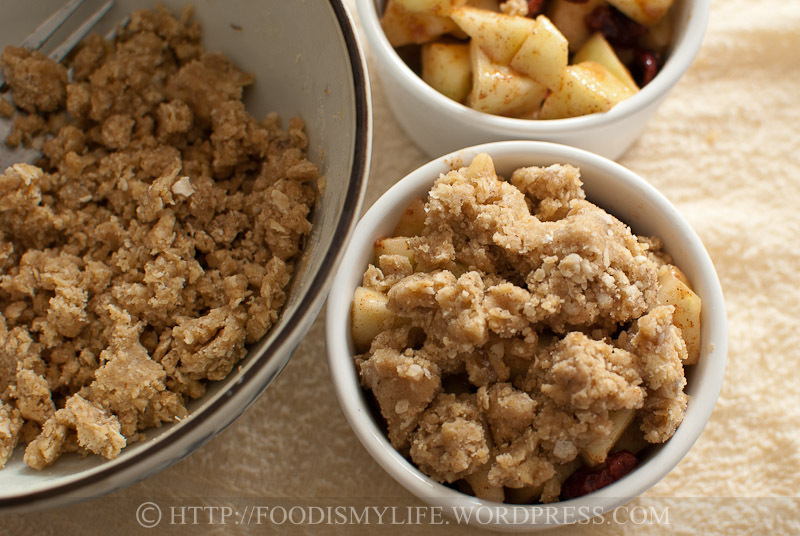 Divide the crumble into 4 portions, and crumble them on top of the apple mix, pressing down gently. 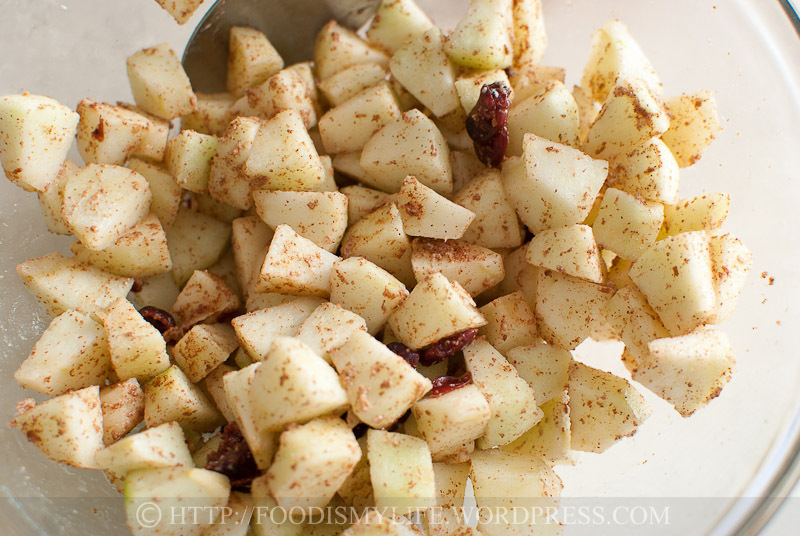 Bake for 30 minutes until the apples are tender, the juices are bubbling thickly and the topping is golden and crisp. 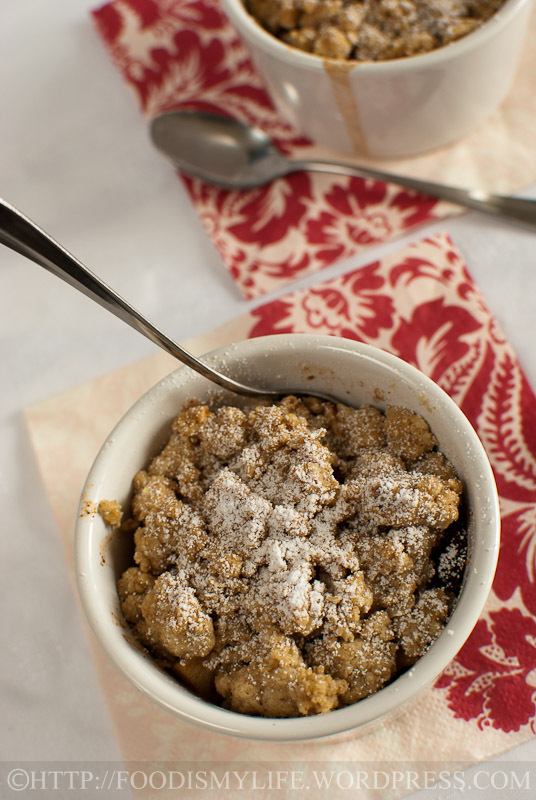 Serve warm or at room temperature, dusted with icing sugar. 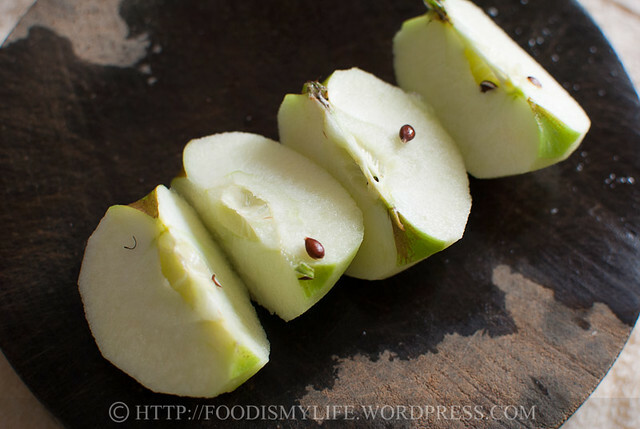 Make ahead: You can refrigerate the apple mix for a couple of hours. 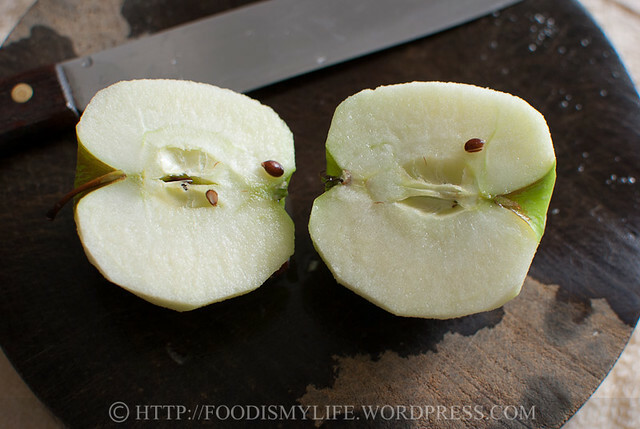 The addition of lemon juice will prevent the apples from turning brown. Reblogged this on Rhonda Thompson Posts. Beautiful and the step by step photography is outstanding. Thanks Alice, using oatmeal makes the dish a little healthier, but gives me plenty of “reasons” to eat more of them! This looks so delectable! Thank you so much for the detailed instructions and step-by-step photos. 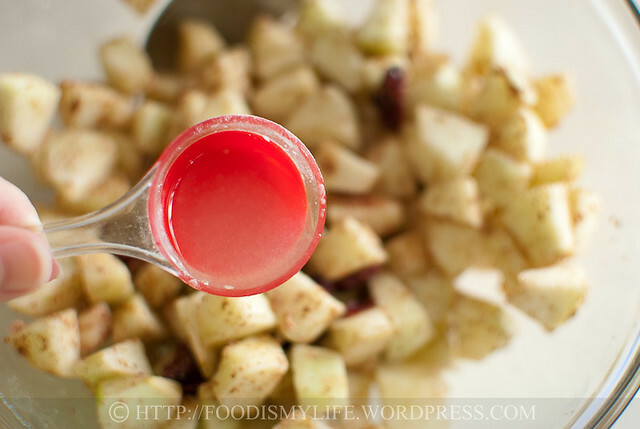 apples, cranberries, cinnamon…wow… u made me drooling a pail! 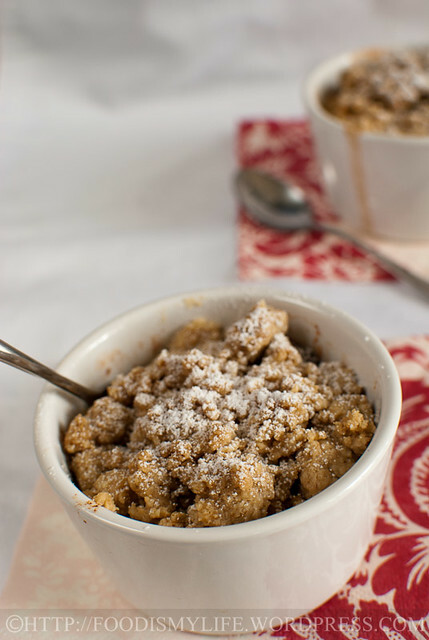 the use of oatmeal must have made this dessert taste heavenly! LOL… Have a great weekend! Hi Zoe, thank you so much for reading my humble blog 🙂 I’m really happy to get to know you and even more happy to know that the step-by-step photos help, have fun baking! Thank you Anuja 🙂 I tried them again without processing any oats or walnuts, they still taste absolutely delicious! I agree with you Zoe, I think the apples can be swapped with plenty of other fruits! Thank you 🙂 Do try them, it’s really good! 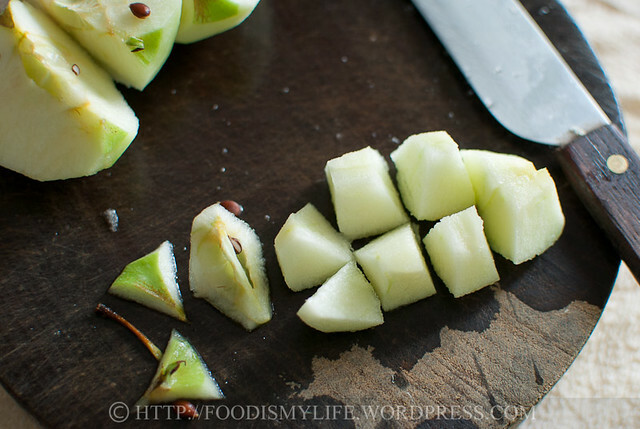 Thank you Angeline, I hope to try it out with pears one day! Thank you Joyce! I just made them again today, am really loving this crumble! How do stay so skinny with all of these yummy treats coming from your oven? I need to stop reading your posts when I am hungry. How great is this! Yum! 🙂 Your photos are so beautiful, always full of sunshine! I am a silent reader of your blog. Just want to say hi:) Most of your post always came with the step-by-step photos! Really appreciate it especially for new baker like me! I am totally new about baking so your step by step really give me an idea how it works:) Thank you for the effort and this really looks great, hope to give it a try soon:) Happy baking! Amazing clicks. 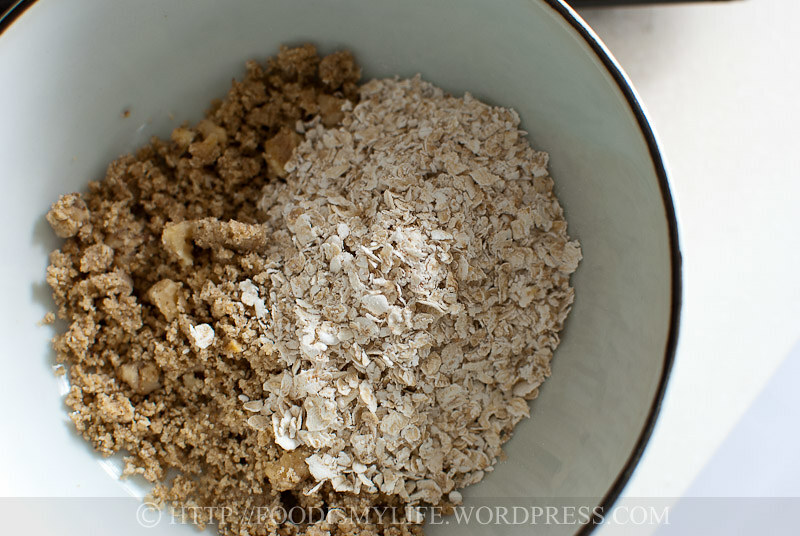 Loved the ides of using oats. Next time, I m also going to swap aome nuts for oats. 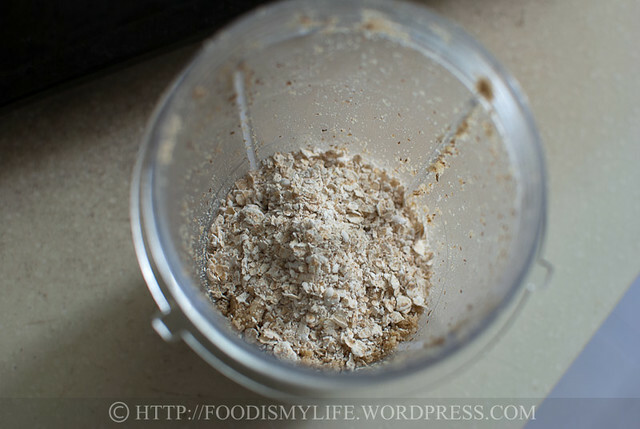 Its a great idea to use oatmeal so much more healthier… lovely photos jasline! hi jasline, delighted to see your oaty version of the crumble , giving it a different mouthfeel as compared to ours. Great! Admiring the rustic look of your crumble! Always a pleasure to have you joining us! thanks! 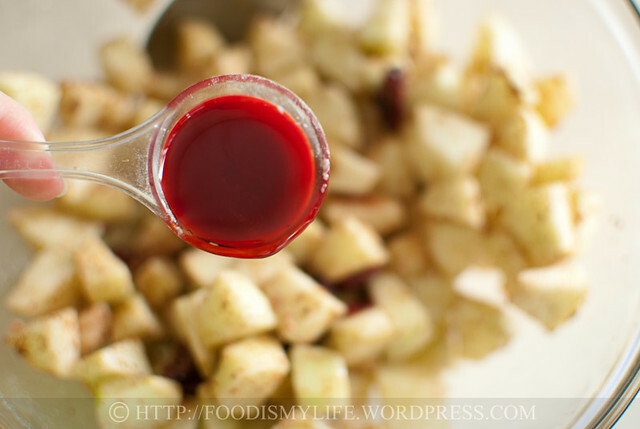 This recipe is very versatile and looks like it works very well with apples and cranberry. Beautiful, your photo’s make me want to jump in with a spoon. Sounds so delicious! Jasline, I would say adding apples is a great idea. 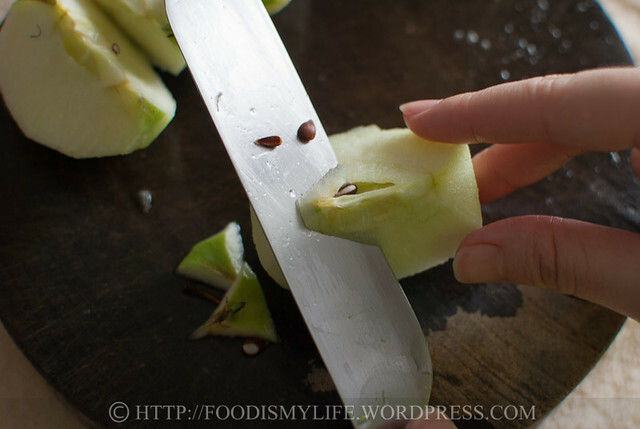 I also think of it…Ended I used up all the pears I bought.